The Mountain Camp is located east of Rellekka, the Fremennik village. It can be found just north of Lali the Troll. You will initially find the Mountain Pass to simply be a huddle of tents around a roaring camp fire, but there are some interesting aspects about the area. One method of reaching the Mountain Camp is by travelling to Rellekka, and then walking east until you arrive at the Mountain Camp entrance pass. 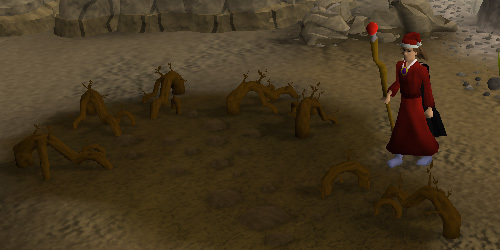 If you have begun the Fairy Tale Part II: Cure a Queen quest and have received permission from the Fairy Godfather to use the Fairy Ring transportation system, you can enter the Fairy Ring code "AJR" to teleport to the Fairy Ring south of the Mountain Camp. 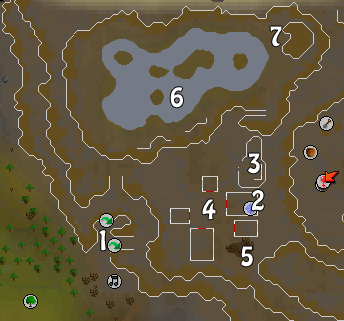 You may use a Slayer Ring to teleport yourself just outside the Fremennik Slayer Dungeon which is just south of the Mountain Camp. Even though it seems like an empty village, there are still a few things to point out. The first time you wish to enter the Mountain Pass (and until you have completed Mountain Daughter), you will need a Rope. On the northern wall of the pass you will find a Cliffside. Select the "Climb" option to use your Rope and scale the rock face. You may then continue north to enter the actual camp area. Once you have completed the Mountain Daughter quest, you may use the Rockslide shortcut just southeast of the Cliffside to enter the village more quickly. 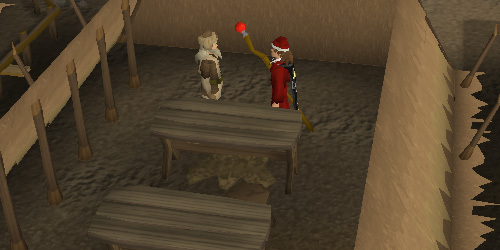 There is only one quest that you can start here in the Mountain Camp: the Mountain Daughter Quest. Start in the largest tent and talk to Hamal the Chieftain. To the north of the chief is a pen with a few Goats. Jokul can also be found in here, but he has no real use other than the Mountain Daughter Quest. 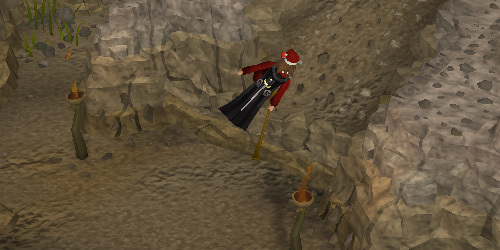 There are also some Rocks that respawn on the ground, as well as a Pole respawn. In the center of the camp you will find several small tents which currently serve no purpose. Several Camp Dwellers are also wandering around the area. 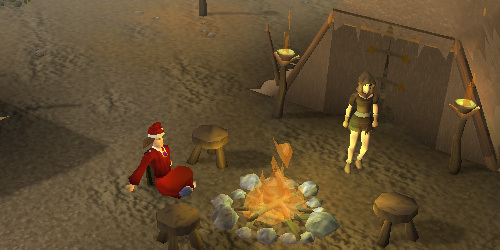 Another notable aspect is the campfire, which can be used to cook food. 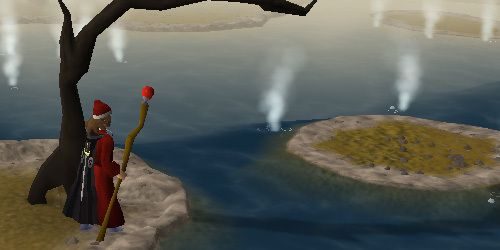 Southeast of the campfire is a large mud pool used in the Mountain Daughter quest. You can dig below the roots to pick up some Mud. Following the path to the north of Jokul's tent, you'll find the Shiny Lake. This is also used in the quest. In the northeast corner of the lake area is the entrance to Kendal's cave, which is used in the Mountain Daughter quest. 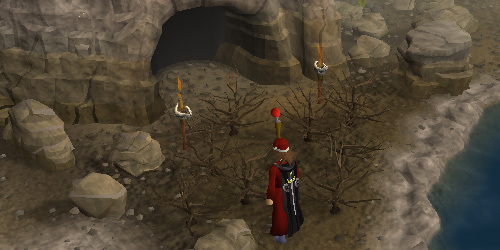 The entrance is blocked by several dead trees which can be chopped down, but players cannot re-enter the cavern after completing the quest. There are two Guards in the Mountain Camp. 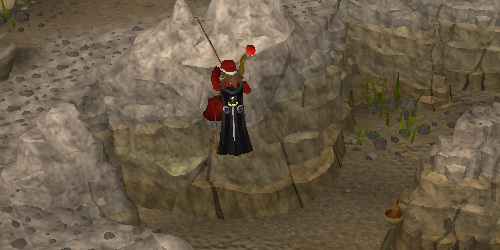 The first guards the entrance to the camp, and will welcome you when you enter using the rockslide shortcut. The second is located in the center of the camp. Hamal is the leader of the Mountain Camp. Players must speak to him to begin the Mountain Daughter quest, in which players are tasked with finding Hamal's daughter, Asleif. 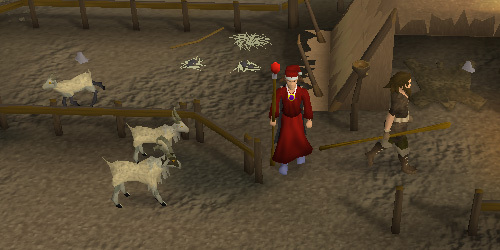 Jokul is found in the goat pen north of Hamal the Chieftain's tent, and he appears to take care of the Mountain Goats wandering around. He also plays a role in the mountain Daughter quest. Ragnar was Asleif's fiancée before she went missing. He is found wandering around just south of the lake. He plays a role in the Mountain Daughter quest, and gives you Asleif's Necklace to bury with her corpse. Camp Dwellers are not aggressive, but will not talk to you properly until you have finished the Mountain Daughter Quest. The level 70 Kendal is extremely aggressive and will attack anything. It doesn't retreat and doesn't die easily. You will have to kill this for the Mountain Daughter Quest and get its helmet. It looks rather fetching and if you lose it you can get another one from the chief at anytime.